Cartersville, Ga. – Patcraft is expanding the company’s collection of stunning terrazzo visuals with its newest resilient product introduction, AdMix Encore, now available. Offered in 36" and 12" square tiles and 24 colors, AdMix Encore features homogeneous construction and a seamless moisture barrier. Products are designed to coordinate with Patcraft’s AdMix, extending the functionality of this successful product platform by incorporating bright colors for accents, wayfinding and branding options while fostering further flexibility in the creation of spaces. Named a 2017 Silver Nightingale Award recipient in recognition for its contribution to the healthcare built environment through product design and innovation, AdMix Encore is a perfect-fit for high-demand, heavy traffic areas. Offering a 2500 psi when installed, the homogeneous solid resin construction allows for scratches, scuffs and stains to be easily buffed. AdMix Encore can be heat welded and/or flash coved, and can be fully and continually immersed in water with no degradation, making it ideal for heavy traffic areas that require large volumes of water for maintenance. 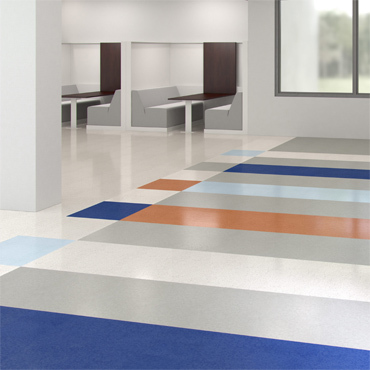 Created using pre-consumer recycled content, Admix Encore features fewer VOCs than linoleum and rubber and is Floorscore certified. Backed by an industry leading lifetime warranty, this beautifully designed, durable product offers performance-driven style that is a trademark of Patcraft’s high-performance brand.